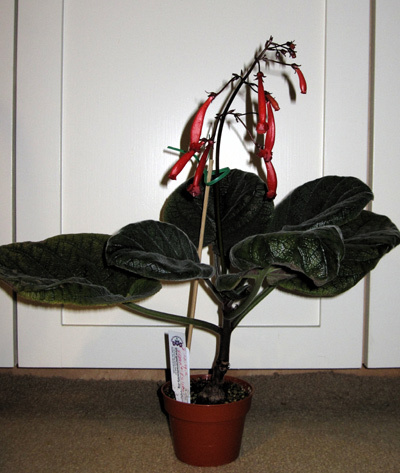 This is Peter Shalit's picture of his plant of Sinningia gigantifolia "Itatiaia". He grew it from seed collected by Mauro Peixoto. At the time of this picture, it was three years old, and was blooming for the first time. Itatiaia, where this collection originated, is Brazil's oldest national park. See the Wikipedia article for more information. Peter writes: "Alain describes this location as 2000 M in elevation and hence this collection has much smaller leaves than the lowland populations of S. gigantifolia." He also mentioned that this variety has larger flowers than a previous plant he grew of this species. This shows the inflorescence of Peter's plant. Each node has a couple of peduncles with one or two flowers each. The flowering stem, peduncles, and pedicels are all very dark shiny red, almost black. It increases the attractiveness of the flowers. There are small bracts at the nodes. 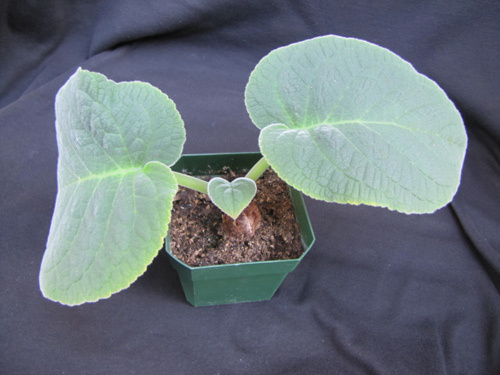 This picture shows a seedling of Sinningia gigantifolia "Itatiaia". The seed (from Brazil Plants) was sown in September 2010 and this picture was taken on 4 December 2011. So far these plants seem less temperamental than the previous collection of this species, which I was not able to keep alive. Here is the tuber of another seedling from this batch. As far as I can tell, this is a double tuber of a single plant and not two separate plants. The conical tuber projecting above the ground is characteristic of young plants of the "Itatiaia" variety. Note the nodes scattered over the visible surface of the tuber. This picture shows a bunch of buds in the plant's crown [August 2014]. The white spot at the base of the budstalk is not a mealy bug, it's the leaf bud corresponding to the leaf visible on the opposite side of the buds. 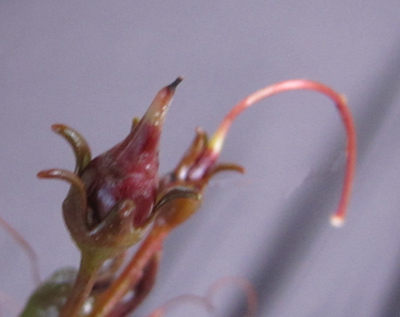 This picture shows the same bud stalk, three weeks later, with cymes developing in the axils of bracts. At this time, I had four plants of this variety. Three of them initiated a flower stalk, but only in this one did the development proceed this far. The stalks on the other two blasted before they had expanded more than a couple cm in length. This plant, in the picture, was the one of the four which was in 100% shade. No direct sunlight reached it. 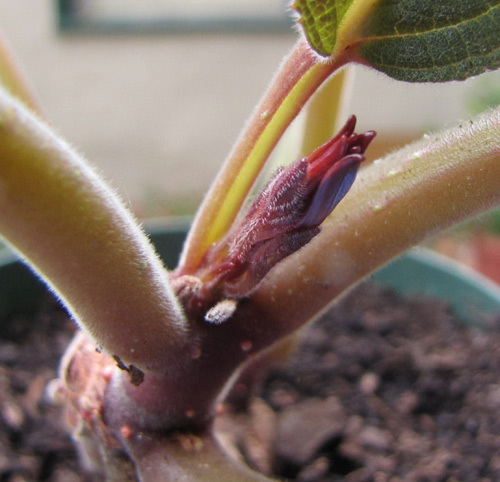 The plant bloomed in September 2014, with one inflorescence. 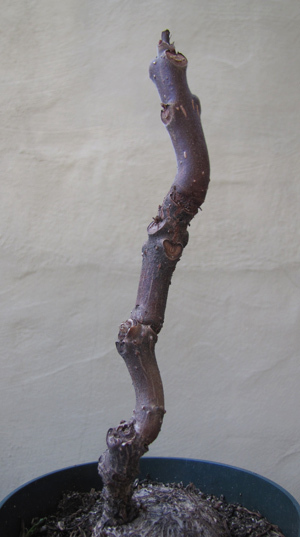 The overall structure was a raceme, with each side branch a standard pair-flowered cyme. The pot diameter is 5 inches [about 13 cm]. The inflorescence usually arcs sideways after starting out vertical. The flowers then hang vertically downward. However, this is not always the case, even on the same plant. A second inflorescence on this plant is more or less vertical. It is noticeable that the flowers are all held on the same side of the stalk, regardless of their horizontal/vertical orientation. This picture was taken in August 2015, and shows the fruit of the "Itatiaia" variety. One can only speculate about the reason for the glossy red color of the fruit. If sinningia seeds are wind-dispersed (or splash-dispersed, like those of S. barbata), why should they be conspicuously colored? Some other sinningia fruits, such as those of some varieties of S. leucotricha are bright red. This photograph was taken in November 2017, and shows the dormant stem of the "Itatiaia" variety. A mature plant of this species does not die back to the tuber, like a regular sinningia does. Instead, the stem gradually extends every year, adding a few more nodes. This plant is in a 6.5 inch [16.5 cm] pot. The stem is 23 cm [9 inches] tall. 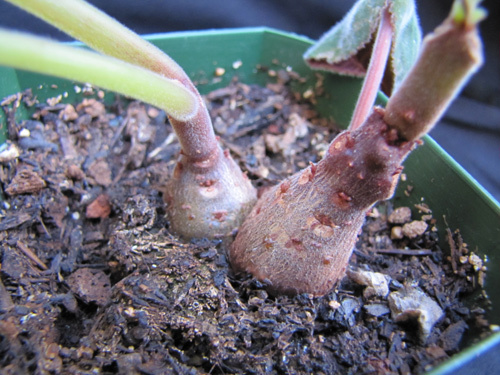 The thickness of the stem suggests that the plant is using it as secondary storage tissue, in addition to the sizable tuber. 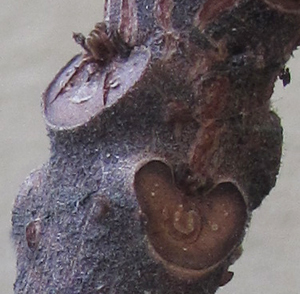 A closeup of the stem shows that the stem nodes look much like the tuber nodes on several sinningia species. The traditional variety, grown by Jon Dixon, has a stem with rather long internodes. The plant retains several nodes of the previous year's stem. The "Itatiaia" form has shorter internodes and shorter flowers, as shown by the picture of Peter's plant at the top of the page. I am growing another form from Brazil Plants seed. Called "Capara�", it also has short internodes so far. The "Capara�" form has not bloomed for me, so I can't compare the flowers. The leaves of the two forms do not differ in any major respect that I can see. Both Itatiaia and Capara� are parks in Brazil, in Minas Gerais state close to the border with Esp�rito Santo. Both macrophylla and gigantifolia mean "large leaf". 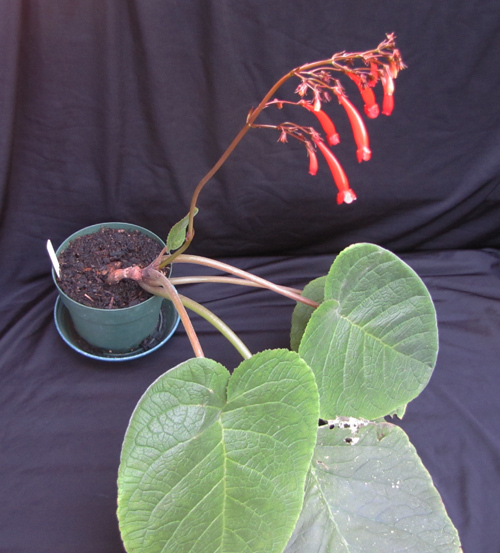 However, as can be seen on this facebook page of the San Francisco Gesneriad Society, they don't have the largest leaves in the genus Sinningia. At least under my conditions, that honor goes to Sinningia defoliata. As Jon Dixon pointed out at the July 2016 meeting of the SF chapter, this means that the two "big leaf" species are outsized by a species whose name means "no leaf" (or perhaps more accurately, "lost leaf"). As far as I know, Jon Dixon's cross between this species and S. "Black Hill" is the only gigantifolia hybrid. Update: It turns out that waaaaay back in the 19th century, even before my grandmother was born, Sinningia gigantifolia (under the name Gesneria discolor) had been hybridized with Sinningia speciosa. Presumably, the hybrid no longer exists, but a print can be seen here. 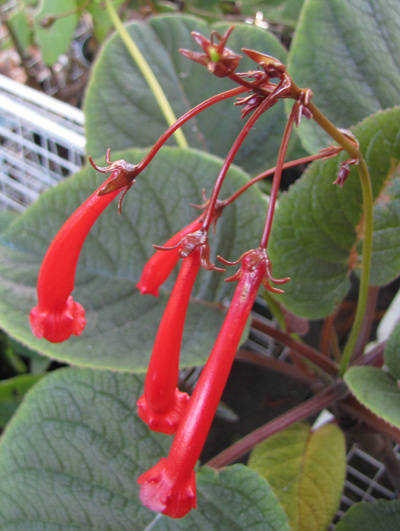 on the Gesneriad Reference Web. Habit Stem upright, very short when young. Plants of the older collection sometimes have alternate leaves (unusual for sinningia). Leaves of the "Itatiaia" and "Capara�" forms are opposite (the normal sinningia pattern). Dormancy Plant has a tuber. Leaves drop in winter. Stems are not completely deciduous but elongate by a few nodes each year. Season Blooms in late summer, sometimes into autumn. 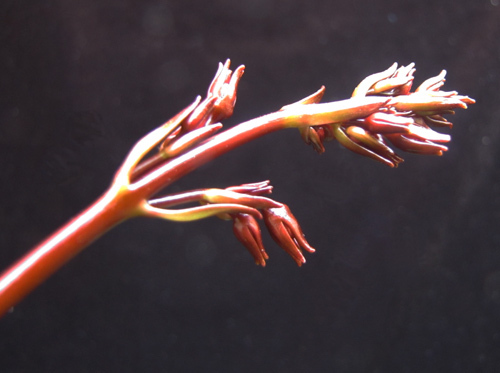 Inflorescence Terminal peduncle. As described and pictured above, the peduncle is a raceme of pair-flowered cymes. Hardiness An "Itatiaia" plant outdoors survived 34 F [1 C] without damage to leaves, and 28 F [-2 C] without damage to the tuber. The "Capara�" form survived similar temperatures in the winter of 2016-2017. Recommended? Yes, if you have space for more than one plant. That will increase the chance of having flowers. Note that the large leaves are easily damaged. Taxonomic group In a subgroup with S. cochlearis within the Sinningia clade. See also the S. gigantifolia page on Mauro Peixoto's web site. Lindley described this species as Gesneria discolor in 1841. Alain Chautems transferred this species to Sinningia in 1990, but the name that would ordinarily have resulted, Sinningia discolor, was unavailable. Sinningia discolor was published in 1904 by Sprague, but this was not the plant Lindley had described, but rather a variety of what we now know as Sinningia speciosa. 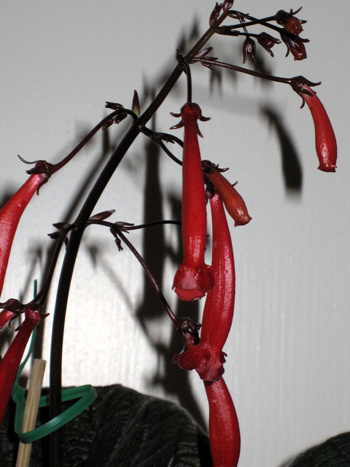 So when Chautems transferred Gesneria discolor to Sinningia in 1990, he had to assign a new name to this species. Hence, Sinningia gigantifolia. Etymology: Latin gigant- ("giant", nom. sing. gigas) + -folia ("leaf").